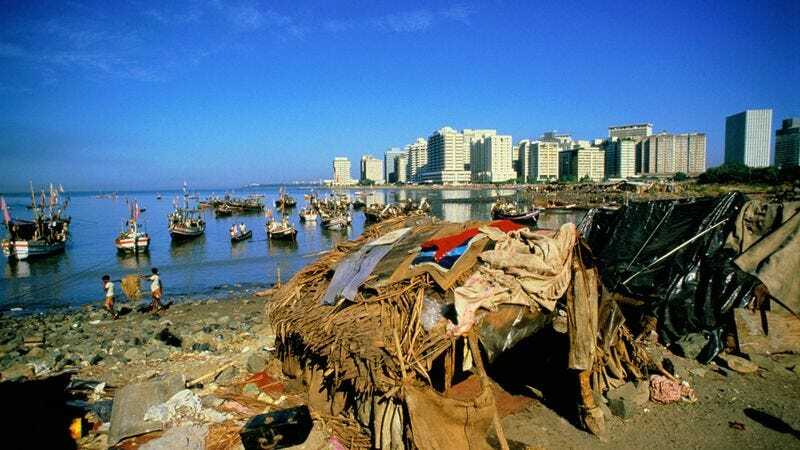 PARIS—At a press conference Tuesday, the World Heritage Committee officially recognized the Gap Between Rich and Poor as the "Eighth Wonder of the World," describing the global wealth divide as the "most colossal and enduring of mankind's creations." "Of all the epic structures the human race has devised, none is more staggering or imposing than the Gap Between Rich and Poor," committee chairman Henri Jean-Baptiste said. "It is a tremendous, millennia-old expanse that fills us with both wonder and humility." "And thanks to careful maintenance through the ages, this massive relic survives intact, instilling in each new generation a sense of awe," Jean- Baptiste added. The vast chasm of wealth, which stretches across most of the inhabited world, attracts millions of stunned observers each year, many of whom have found its immensity too overwhelming even to contemplate. By far the largest man-made structure on Earth, it is readily visible from locations as far-flung as Eastern Europe, China, Africa, and Brazil, as well as all 50 U.S. states. "The original Seven Wonders of the World pale in comparison to this," said World Heritage Committee member Edwin MacAlister, standing in front of a striking photograph of the Gap Between Rich and Poor taken from above Mexico City. "It is an astounding feat of human engineering that eclipses the Great Wall of China, the Pyramids of Giza, and perhaps even the Great Racial Divide." According to anthropologists, untold millions of slaves and serfs toiled their whole lives to complete the gap. Records indicate the work likely began around 10,000 years ago, when the world's first landed elites convinced their subjects that construction of such a monument was the will of a divine authority, a belief still widely held today. Though historians have repeatedly disproved such claims, theories still persist among many that the Gap Between Rich and Poor was built by the Jews. "When I stare out across its astounding breadth, I'm often moved to tears," said Johannesburg resident Grace Ngubane, 31, whose home is situated on one of the widest sections of the gap. "The scale is staggering—it makes you feel really, really small." While numerous individuals have tried to cross the Gap Between Rich and Poor, evidence suggests that only a small fraction have ever succeeded and many have died in the attempt. Its official recognition as the Eighth Wonder of the World marks the culmination of a dramatic turnaround from just 50 years ago, when popular movements called for the gap's closure. However, due to a small group of dedicated politicians and industry leaders, vigorous preservation efforts were begun around 1980 to restore—and greatly expand—the age-old structure. "It's breathtaking," said Goldman Sachs CEO Lloyd Blankfein, a longtime champion and benefactor of the rift's conservation. "After all we've been through in recent years, there's no greater privilege than watching it grow bigger and bigger each day. There may be a few naysayers who worry that if it gets any wider, the whole thing will collapse upon itself and take millions of people down with it, but I for one am willing to take that chance." Added Blankfein, "Besides, something tells me I'd probably make it out okay."